Technology infiltration has caught up with the jewelry industry and has provided us with the capability to design and manufacture precisely scaled and proportioned models with the help of the computer-aided design and computer-aided manufacturing process (CAD/CAM). This latest technology allows the jeweler to adapt current fashion trends, make design changes, create unusual and innovative one-of-a-kind pieces and increase sales, all while saving time at the bench. 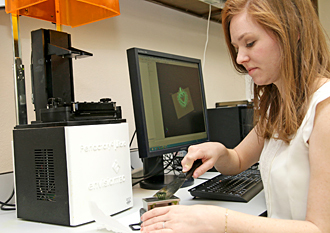 The Texas Institute of Jewelry Technology has added a new program to train students in the CAD/CAM technology, give them the competitive edge they need in today’s job market and help fill the demand for CAD/CAM specialists in our industry. Computer-Aided Jewelry Design is a 36 credit-hour certificate course. Our classroom is outfitted with 18 learning stations that run Matrix 3D Jewelry Design Software from Gemvision. Students design virtual jewelry on screen, color the image and send the file to one of our multiple-axis milling system mills that cuts a perfect wax model that is suitable for casting or to our Perfactory® Micro 3D printer for a castable model.